New York- In the wake of the French military intervention in Mali late last week, I felt like it was time for TWD to kick into high gear. 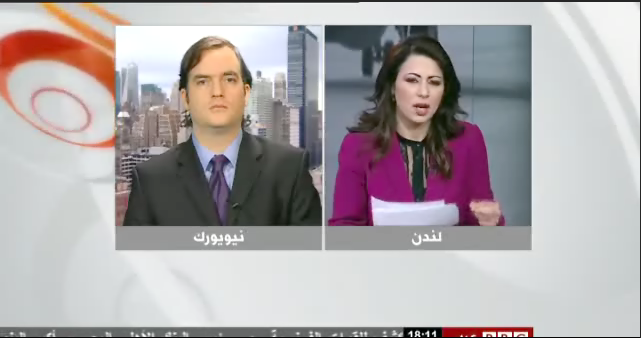 On Monday, I appeared on BBC Arabic’s News Hour programme from the beeb’s Manhattan studio (which was actually the NYC AP bureau). 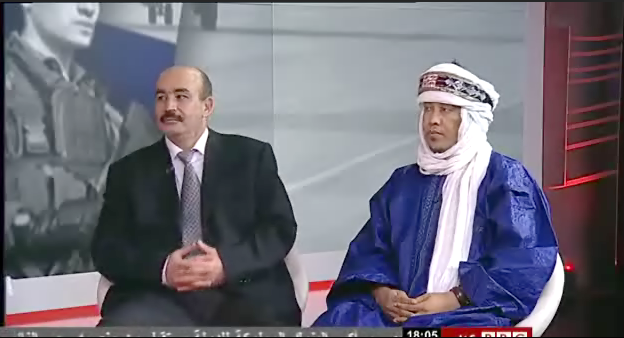 The show was hosted by Lebanon’s lovely Fida Basil and featured Mohamed Larbi Zitout, a one time Algerian ambassador to Libya-turned outspoken Algerian dissident in exile in the UK and Akli Shaka, the Leeds-based spokesman for the Imohag (alt. Imuhagh–the endonym of the Tuareg people) and myself. I also did a piece for CNN.com (pictured above) synthesizing recent developments with my work on the ground there in 2012. Mohamed Larbi Zitout. left, and Akli Shaka, right. One of the topics I fielded during the segment was whether or not there would be a Salafi blowback on the French metropole or in amongst any of Mali’s neighbors where security is already inherently sketchy and AQIM essentially has freedom of movement across several over the borders. As I was answering an email to colleague this morning, I cited the GIA’s hijacking of an Air France flight 8969 heading from Algiers to Paris’s Orly airport on Christmas Eve 1994 and the Paris metro bombings in 1995 (as with all terrorist related events related to Algeria’s bloody civil conflict there of course is an alternate theory that the DRS-Algeria’s all-knowing intelligence service-was behind some or all of these events). Not suggesting the GIA in the 1990s is a precise direct analogy but the experience offers some insight. 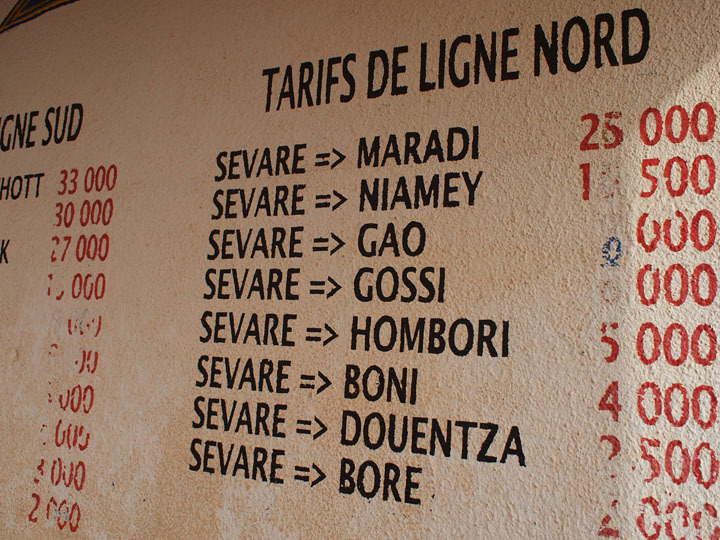 Monday I thought it all but assured that Mali-based Salafi-jihadis would strike in a neighboring state in the very least. 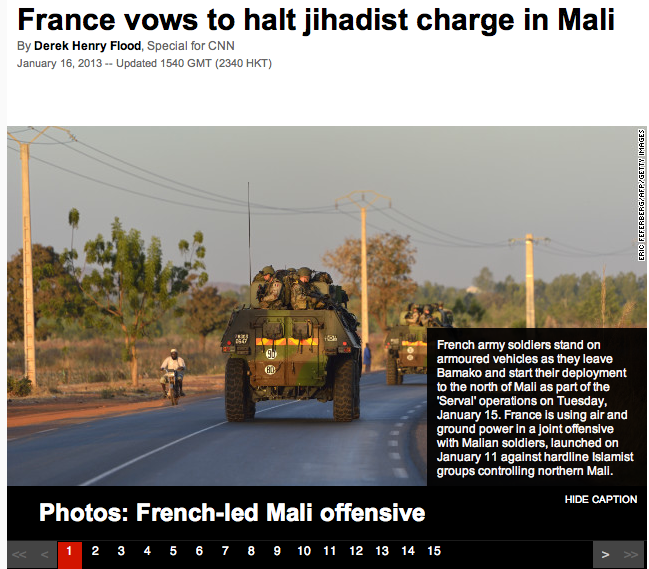 Whether they have the capability to strike on French soil remains to be seen I suppose. Let’s hope that is not the case. In the immediate aftermath of the largely successful raid on the jet at Marseille’s airport in which the four GIA operatives were killed by French commandos, four Catholic priests were murdered in in the immediate aftermath in retribution in Tizi-Ouzou east of Algiers in the Kabylie region which has remained a locus of conflict in some degree or another until the present. As soon as I hit send on said email, I then checked the news to see something that seemed like the logical next step: a massive raid was launched on a sprawling energy installation’s complex today in which an estimated 41 expatriate workers were taken hostage by men believed to be under the command of Mokhtar Belmokhtar’s (a.k.a. MBM, a.k.a. Belawar) AQIM faction “La katiba des Moulathamine” (or is it al-Mouwaqiin bi Dam-“Signatories in Blood battalion” a constituent of or breakaway from the “Masked Brigade”-it seems there is no agreement/too little information at the time of this writing) or AQIM itself depending on reports. In what was likely a carefully planned assault, militants struck the Ain Amenas liquified natural gas field project being operated by BP, Norway’s Statoil, and Algeria’s state energy concern Sonatrach on Algeria’s eastern border with Libya due south of the triple border with Tunisia.Many believe that Belmokhtar was behind the audacious raid in Algeria’s Illizi Wilayat (province), bringing a flurry of attention to a character generally little known in Anglophone media circles. There had been speculation last fall that Belmokhtar had been dismissed as commander of his men by AQIM’s overall Algeria-based emir, Abdekmalek Droukdel (a.k.a. Abu Musab Abdel Wadoud) which Droukdel reportedly later denied. The biggest story suddenly surged from the war in Mali to one of the biggest terror attacks on Algerian soil in many years. 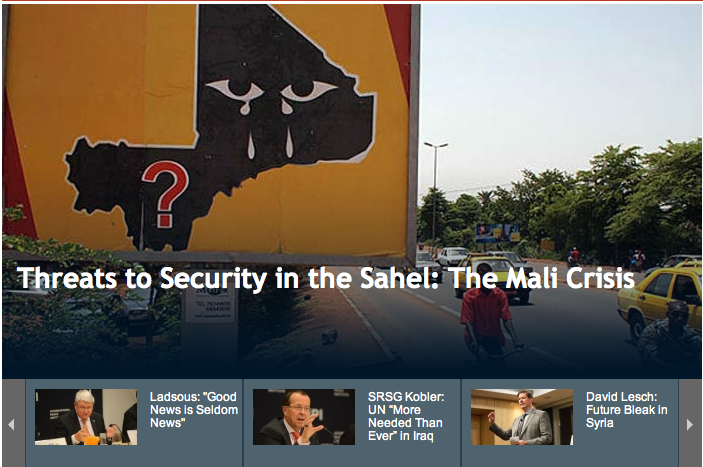 Just like that, the news cycle had to catch up to speed on events to Mali’s north in the chaotic midst of learning about Mali itself. As with its captured diplomats in Gao, Algeria taking its characteristically hard line, claims it categorically will not negotiate-much less pay ransoms for-hostages, foreign or indigenous. 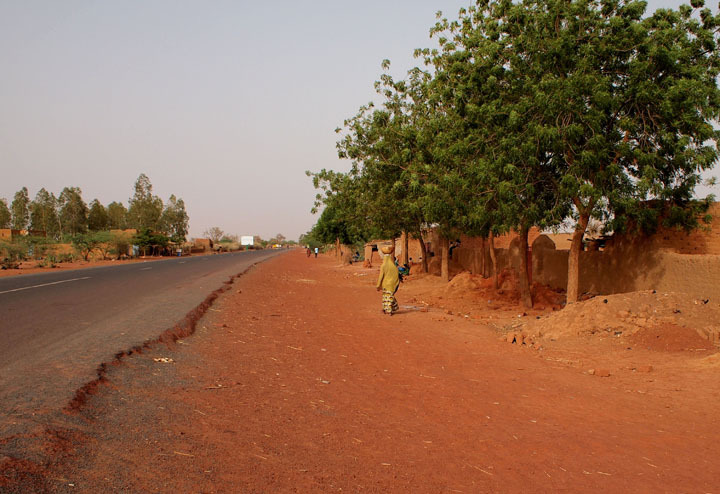 Just before the start of the Mali conflict in December 2011, I edited a report by Dario Cristiani entitled “Mixing Ideological and Pragmatic Jihad: A Fresh Look at Mokhtar Belmokhtar.” If you are following me on Twitter, you can DM for a PDF if interested. UPDATE: In keeping with Algiers’s stated no-negotiations position (despite the fact the government said talks were attempted), Algerian forces launched what could be called a disastrous ‘rescue’ mission. Reports right now are conflicting about whether the operation is still ongoing or whether it has already concluded. Whatever has happened, it has likely been quit bloody. Myself and presenter Fida Basil. Uttering ‘Jamaat at-Tawhid w’al-Jihad fi Gharb Ifriqiyya’ is a hell of a lot more of a mouthful than MUJAO! 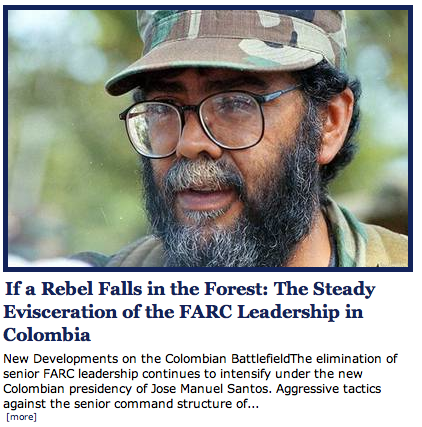 Before the current phase of the conflict kicked off, a photo from this blog was used in a report by the International Peace Institute, a UN-linked think-tank, in mid-December. UPDATE: Friend and colleague, the Toronto-based analyst Andrew McGregor appeared on CBC News to talk about the history of Mokhtar Belmokhtar, the impact of the Ain Amenas raid, its sophistication and beguiling logistical improbabilities. He also discussed the possible long term effects on Algeria’s energy industry, a key source of that country’s GDP. Click play below. New York- Off to Libya tomorrow evening via Cairo and Alexandria. Can’t stop, won’t stop. My colleague at Jamestown, Andrew McGregor appeared on PBS Newshour with Jim Lehrer discussing the possible military strengths and weakness of Libya’s opposing forces. 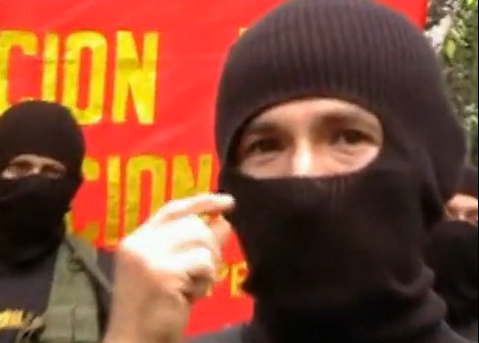 The Shining Path's Upper Huallaga Valley leader Comrade Artemio in a video grab I made from Youtube. New York- I haven’t been posting nearly often enough in the hectic preparation for this year’s Jamestown Foundation annual terrorism conference at the National Press Club this Thursday, December 9th. This past week we released our eleventh issue of Militant Leadership Monitor with biographies of South Sudanese leader Salva Kiir by Andrew McGregor (an especially timely report before the January 9th independence referendum), the Shining Path’s Comrade Artemio by me, Lashkar-e-Taiba’s Azam Cheema by Animesh Roul, and Saudi AQAP explosives fabricator Ibrahim Asiri by Murad Batal al-Shishani. New York- The new issue of Militant Leadership Monitor is online. In this issue we have two pieces from two of Yemen’s three fronts. 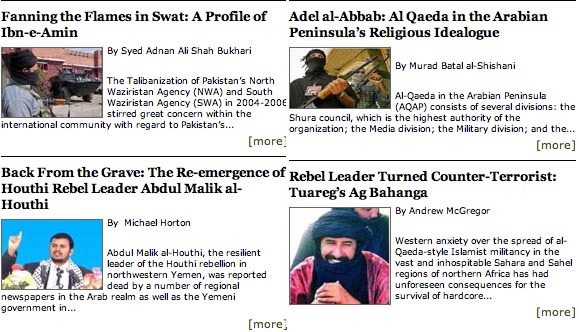 A profile of Adel al-Abbab of AQAP by Murad Batal al-Shishani and a bio of Abdulmalik al-Houthi leading the Zaidi rebellion in the country’s north by Michael Horton. Moving across the Arabian Sea up to Pakistan, Syed Adnan Shah Ali Bukhari tells us of the brutality of Ibn-e-Amin in the strife-torn Swat Valley. Heading west, we have a profile of Ibrahim Ag Bahanga, a hard bitten Tuareg rebel leader hailing from the Mali-Algeria border. Additionally, I have briefs on the arrest in Karachi of Mullah Omar’s son-in-law and the death of JI’s Bali bomber, Dulmatin, in a suburb of Jakarta last month. Subscribe to Militant Leadership Monitor Here!